Coral Princess Cruises’ 35 metre catamaran Coral Princess II has recently returned to service on the Great Barrier Reef following a major refurbishment and mechanical upgrades. 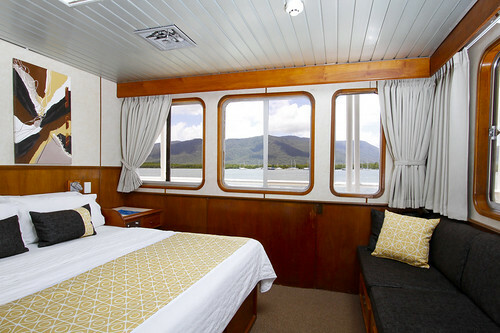 The 44-passenger small-ship, which operates award-winning 3,4 & 7 night cruises on the Great Barrier Reef year-round from Cairns, has received a full interior upgrade, whilst noise reduction technology has been added throughout and the ship’s exterior has been completely repainted. Coral Princess Managing Director Tony Briggs, who along with his wife Vicki is celebrating the 30th Anniversary of Coral Princess Cruises in 2013, says that the bright and airy public areas, refreshed décor and revitalised furnishings have been drawing rave reviews from guests since the ship returned to service in early February. 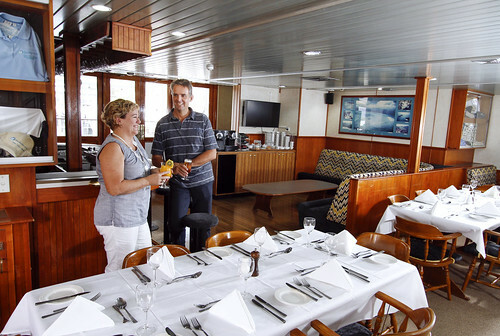 As part of the refurbishment, the ship’s spacious sun deck has also been remodelled and furnished with stylish teak dining tables, allowing for the unique experience of al fresco dining under the stars on the Great Barrier Reef. The refurbishment of Coral Princess II completes the company’s significant fleet upgrade program, which began with the refurbishment of sister-ship Coral Princess during 2012. Briggs said that the completion of the fleet upgrade ensures that both Coral Princess and Coral Princess II offer comparable amenities and fittings to the company’s flagship, the 72-passenger Oceanic Discoverer. Australian-owned Coral Princess Cruises pioneered the concept of small-ship expedition cruising in Australia in 1984 and the company celebrates its 30th Anniversary in 2013. In addition to the highly successful Great Barrier Reef program, the company is the pioneer of expedition cruising on Western Australia’s Kimberley Coast and a unique Cape York & Arnhem Land cruise between Cairns and Darwin. Further afield, small ship cruises are offered throughout the South Pacific including Papua New Guinea, Melanesia and New Zealand, with an inaugural expedition exploring Indonesia’s Spice Islands and Raja Ampat regions scheduled for September 2013.